Titanfall was the reason many gamers broke open their piggy banks and bought an Xbox One. But according to Respawn Entertainment's CEO, the sequel won't be a Microsoft exclusive. Since Titanfall hit the market last year, most of us assumed that a sequel would eventually materialize, but the folks at Respawn Entertainment have been tight-lipped about the possibility. However, in an interview with IGN, Respawn co-founder and CEO Vince Zampella confirmed the sequel and simultaneously broke Microsoft's heart; Titanfall 2 will also be available on Sony's hardware. So we're working on a sequel. No official name yet, but we're working on that. That's the main focus but we're starting up a second team and doing some smaller stuff too. Small, exploratory, taking it slow! It'll be multiplatform. I doubt many people are genuinely surprised by this news. Titanfall's exclusivity wasn't the beginning of a love affair between Respawn and Microsoft. Sony simply wasn't ready to reveal its console specs and asked the developer to create a PlayStation Vita edition instead. Respawn wasn't interested in creating a Vita exclusive, and the company needed help developing a server support structure. So, Microsoft got the exclusive. The biggest complaint leveled against Titanfall revolves around the "single-player" components. 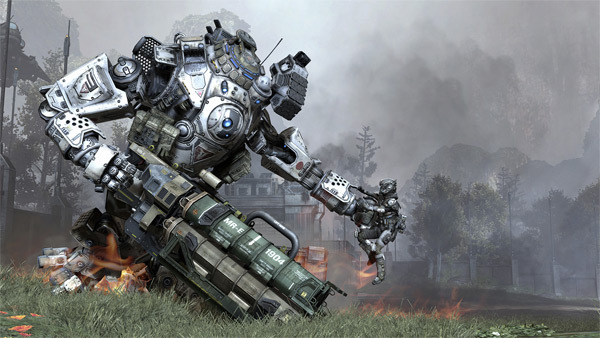 Respawn took an experimental approach to the campaign's design, and it didn't really connect with gamers. So, many players are probably wondering how Titanfall 2's campaign will be handled. I wouldn't have done it differently. We set out to do it and it was one of our goals. I mean it obviously prohibits a certain group of people playing the game, and as content creators you want to get into as many peoples' hands as possible. We put some single-player elements in there though, and tried to mix it up. Maybe we could have mixed things up a bit better because some people blew right by it and didn't even see it because there was so much action happening around it. It's tough, because if you hit people over the head with it becomes intrusive, and there are people who don't want or care about it. Where does the needle fall? I think it takes a while to figure that out and we haven't figured it out yet. I think that's a fantastic way to do it. I think having the maps like that in packs, it does split the community and it makes it harder for matchmaking, it's messy. Yeah. I don't know we won't do it again, I can't say that for sure, but the idea would be to do something different. This week, Respawn ditched the subscription pricing on Titanfall's season pass, so the developer may already be putting its money where its mouth is. Though, the maneuver could be interpreted as a last-ditch effort to get people back into Titanfall. Your stance on that question probably says a lot about your feelings toward Titanfall. Feel free to fight about it in the comments.